Being in charge of a small to medium-sized business is no walk in the park. You have to worry about hiring new team members, boosting morale, and making sure your customers are happy - all while trying to achieve your business goals. To top it all off, you need to install a proper IT infrastructure that runs smoothly. As a business owner, you can simply delegate some of these tasks to your employees. But when it comes to your IT needs, you can also outsource some, or all of your IT needs to a Managed Service Provider in your area. IT outsourcing is a good idea for companies that are planning to grow but have a limited budget or IT experience to do so. With the right provider, everything from IT support, cloud services, data security, VoIP, disaster recovery and more are covered. In other words, you spend less time managing your IT infrastructure and more time growing your business. Aside from this, here are some additional reasons how you can benefit from outsourcing. Many businesses understand that they can save a lot of time and money if they outsource their IT. Imagine having to purchase new hardware for employees, maintaining your servers, accounting for potential IT disasters such as cyber attacks, not to mention the cost of hiring experienced IT technicians. These costs can be taxing on your company especially when you could be investing it on the core components of your business. In fact, findings from a study conducted by Alinean Inc. found that small and medium-sized companies spend 4-7% of their revenue on IT, while larger companies tend to spend less than 3%. What’s interesting is that SMBs that were frugal with their budget and hired MSPs to handle their IT problems were more successful. With IT outsourcing, you can pay for exactly what it is your business needs. Other than focusing on the IT costs, hiring MSPs saves on the general and administrative costs of your business. And, while the amount your company saves varies on the type of service you’re willing to purchase, one thing is certain - you get more bang for your buck with third-party providers. Another good thing about IT outsourcing is that looking for updates and new technology to stay ahead of the game won’t be your top priority. Tapping into an MSP with a specialized and experienced workforce in IT helps unlock new systems and methods. Of course, this also means you don’t have to train or hire staff every time new software is released. As cloud services and virtualization are rapidly taking the market by storm, you might want to implement these new technologies immediately. The problem is, installing new systems at your business can be a long and cumbersome process. Fortunately, many experienced IT companies can help alleviate this and can even explain to you the services without hurling a bunch of technical jargon your way. As previously mentioned, if you’re a small business owner, you’ll want to be able to focus on the core elements of your company. This also opens up your business to flexible solutions. Not in the office for the conference meeting? Do you hate commuting? Do you work better at home? No problem. Due to the proliferation of cloud, VoIP and virtualized services offered by MSPs, companies can now provide an option for employees to work from home or on the go. Data is a vital part to any business, and precautions must be taken to protect it. Business data is so important, that 40 percent of businesses that lose crucial data close down a few months after the incident. Additionally, in 2014, Symantec claimed that 60% of cyber attacks were directed at SMBs. IT security providers can help you rest easy by managing much of the potential risks. In other words, they create and test disaster recovery solutions, keep your data safe, and also teach you how to avoid potential cyber breaches. A lot of business owners who already have an IT department scoff at the idea of outsourcing work. However, even outsourcing a part of your IT requirements can bring about benefits you might not have thought of. For starters, if your in-house IT staff is only one team member, it can be hard for them to take time off. Unlike the equipment they monitor, IT personnel are not machines and might need to take a day off due to illness or to spend time with their families. 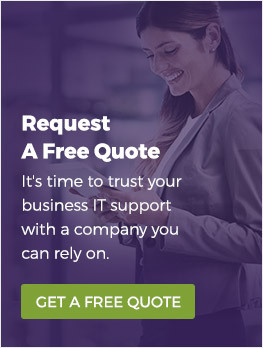 With an outsourced IT department on standby, you don’t have to worry about going without support while your staff is away.Tasks that your IT team never seem to have time to get to can also always be outsourced. Additionally, having a second set of eyes look over your networks or review your backups is always a great way to ensure your business is truly protected. When considering which part of your IT infrastructure you want to outsource, it’s best to go with one that is easily extractable from the core process of your business. For example, Cloud backup’s are probably not the focus of your business but it is a commodity that will help your business scale the market. Other areas you can outsource would be 24/7 IT support, security, VoIP, and virtualization solutions, to name a few. A Global IT Trends report states that “within five years, companies will have outsourced approximately 70 percent of their infrastructures.” As a small business owner with limited IT expertise, it can be scary to get on the outsourcing bandwagon. However, the number of benefits that MSPs provide for your business cannot be ignored. If you’re hesitant to try, you can always start by outsourcing only a part of your IT needs. Choosing to outsource your IT can be a tough decision. But with Constant C it doesn’t have to be. We provide the best in IT services that will help your small business grow and stand out from your competition. Call us today at (204) 272-1458 to find out how working with us will benefit you. Because tomorrow is too late.